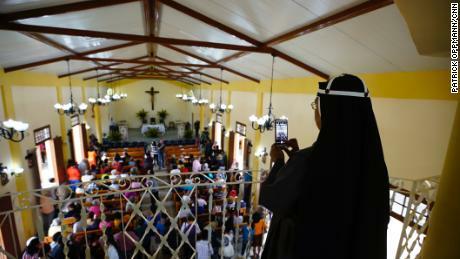 A Roman Catholic nun takes a photo with her phone at the Sacred Heart Church of Jesus in Sandino, Cuba. The church is the first new Catholic church to be built on the communist-run island since 1959. SANDINO, Cuba — The first new Roman Catholic church to be completed in Cuba since the country’s 1959 socialist revolution was inaugurated with the aid of a Florida congregation Saturday, in a ceremony that observers called a hopeful sign amid international tensions.The Parish of the Sacred Heart of Jesus in the western town of Sandino is one of three Catholic churches authorized by Cuba as part of a warming between the Vatican and the island’s Communist government.